For someone who’d basically worked non-stop since signing her first record contract in 1961, Diana Ross was especially busy in the summer of 1977. Ross the actress was gearing up to film her third motion picture, The Wiz, in which she would play the central role of Dorothy; the $24 million production would be her biggest budget film yet and required extensive rehearsals to learn the music and choreography. Meanwhile, Ross the singer was recording two albums simultaneously; during the day, she worked with producer Richard Perry at his Studio 55 in Los Angeles on what would eventually become Baby It’s Me, and in the evenings she recorded with Hal Davis at Motown, working on disco songs to follow-up her smash 1976 hit “Love Hangover.” According to Rolling Stone writer Ben Fong-Torres, “She isn’t sure — and in fact doesn’t care — which Motown will release first. ‘Whichever they need,’ she says. ‘Whatever the market looks like it’s ripe for.’ She is pleased at the prospect of having enough product around to free her to pay full attention to The Wiz” (August 11, 1977). As it turned out, the Richard Perry-produced album came out first; the superb Baby It’s Me was released in September of 1977 and became a moderate success for the singer, with singles from that album riding the charts into the spring of 1978. 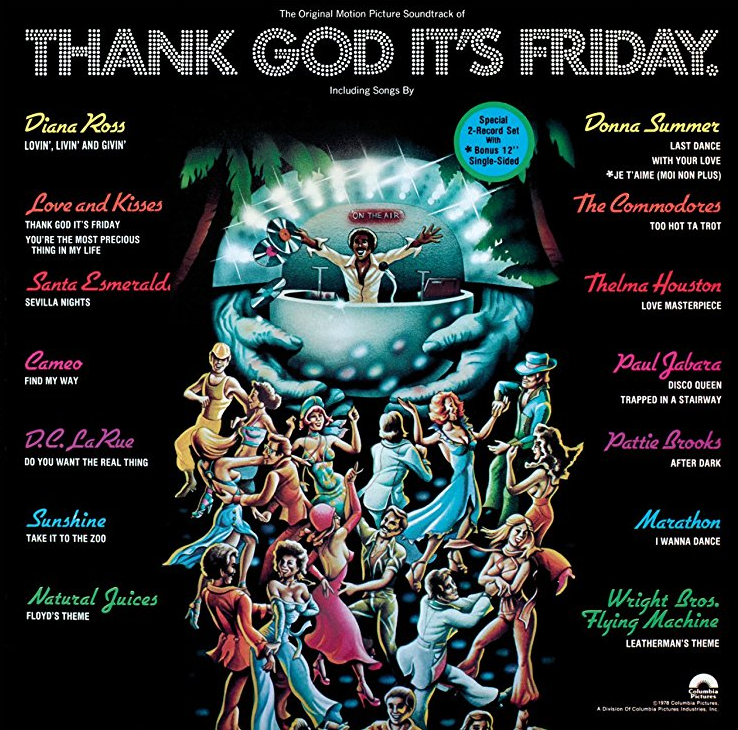 In May, one of the disco songs Diana recorded with Hal Davis was included on the soundtrack to the film Thank God It’s Friday; “Lovin’, Livin’ And Givin'” was never officially released as a single in the United States, but did end up climbing to #35 on the Billboard’s National Disco Action Top 40 chart. Other songs recorded by Ross and Davis included a dance cover of the 1969 Marvin Gaye-Tammi Terrell duet “What You Gave Me” (written by Diana’s old friends Nickolas Ashford and Valerie Simpson) and “Sweet Summertime Livin’,” written by Kenny Stover. During the summer of 1977, Diana also recorded a batch of disco songs with Brian and Eddie Holland, two of the men responsible for most of her Supremes hits from the previous decade; after several years away, the Hollands had returned to Motown in 1975 to work with The Supremes again, producing a pair of albums for the trio in 1976, High Energy and Mary, Scherrie & Susaye). But when Ross (Motown 907) was finally released in September of 1978, most of the new disco songs were left off in favor of older vault tracks and even a few previous releases. Only two of the Hal Davis productions were used (“Lovin’, Livin’ And Givin'” and “What You Gave Me”), and none of the Holland songs showed up; veteran Motown singer, songwriter, and producer Greg Wright turned in two new songs, the sleek ballad “Never Say I Don’t Love You” and the disco scorcher “You Were The One.” Meanwhile, likely in response to writer, producer, and frequent Ross collaborator Michael Masser signing a much-publicized publishing deal with Arista Records in late 1977, Motown dug up three of his productions for inclusion, including a never-before-released ballad and the failed 1975 single “Sorry Doesn’t Always Make It Right.” These tracks, along with a few others, result in a hodgepodge of an album, one that’s a strange hybrid of a studio LP and a compilation; nobody seemed to know what to do with it, least of all Motown, which only released one single — and waited nearly three months to do it! The fact is, even if Ross had been the exciting, cohesive disco album many expected it to be, it likely would have been lost in the wave of publicity — mostly negative — surrounding The Wiz. The film debuted in October to lackluster reviews and business, and the soundtrack performed far below expectations. Although Diana launched an all-new stage extravaganza at the Universal Amphitheater in Los Angeles on September 19, 1978 and performed a few of the songs from Ross during the show, the album slipped by many record buyers unnoticed and fell off the Billboard 200 after 17 weeks. It’s a shame that Ross feels like such a missed opportunity, because there are true moments of greatness to be found on the album; “You Were The One,” “Never Say I Don’t Love You,” and “To Love Again” showcase Diana Ross at her vocal best, and all three could have and should have been big hits. But there’s no denying that the seemingly random lineup makes the album a challenging listen, especially since it immediately follows the most seamless album of the singer’s career. 3. Never Say I Don’t Love You: Back in 1973, while performing live at The Royal Albert Hall in London, Diana Ross sang a song called “Together,” written by members of Motown vocal group The Devastating Affair. That group happened to be singing background for Miss Ross at the time, and she told the audience, “Not only are they fantastic singers, but they are great songwriters and musicians, as well. In fact, I’m producing some of their things and, yeah, I have a record coming out pretty soon that was written by The Devastating Affair.” It’s likely she’s referring to the Marvin Gaye duet “You’re A Special Part Of Me,” penned by three of the five group members, Harold Johnson, Andrew Porter, and Greg Wright (Karin Patterson and Olivia Foster, the other two members, can be heard singing background on the track) and released in September of that year. Although the bulk of the material recorded by The Devastating Affair was never released, Greg Wright went on to write and produce quite a bit at Motown; with Karin Patterson, he gave The Supremes a disco hit in 1975 with “He’s My Man” (from the group’s “comeback” album, The Supremes). Here, Wright and Patterson turn in a smooth, supple ballad that’s one of the great hidden treasures of Diana’s late-70s album output, effortlessly combining the sparkling soul of Diana’s Richard Perry collaborations (Baby It’s Me) with glossy Easy Listening popular at the time. Wright crafts a shimmering instrumental track with a prominent steel guitar and pretty background vocals, and coaxes a velvety performance from Miss Ross, whose crystal-clear voice has rarely been used to better effect; it also helps that Diana is given such a strong, clear melody with which to work. Listened to today, “Never Say I Don’t Love You” sounds like a hit; it easily could have gained strong Easy Listening airplay at the time, and it’s a shame that Motown didn’t think outside the “disco club” and decide to push a ballad on Miss Ross. Instead, this superb production was relegated to being used as a b-side on some international releases of “No One Gets The Prize” from The Boss. 4. You Were The One: If ever Motown completely botched a chance to have a massive hit on Diana Ross, this was it. “You Were The One” is, quite simply, one of the best dance songs ever recorded by Diana, a classy, funky club song with her best vocal performance in years. As with the previous track, this tune was written by Karin Patterson and Greg Wright and produced by the latter; also like “Never Say I Don’t Love You,” it’s a shimmering, lush recording that both evokes the spirit of the late 1970s while never becoming mired in dated production elements. Wright produces the song with a popping bassline as the driving heartbeat, keeping instrumental flourishes to a minimum and emphasizing both Diana’s elastic vocal performance and the gorgeous, layered voices backing her up. 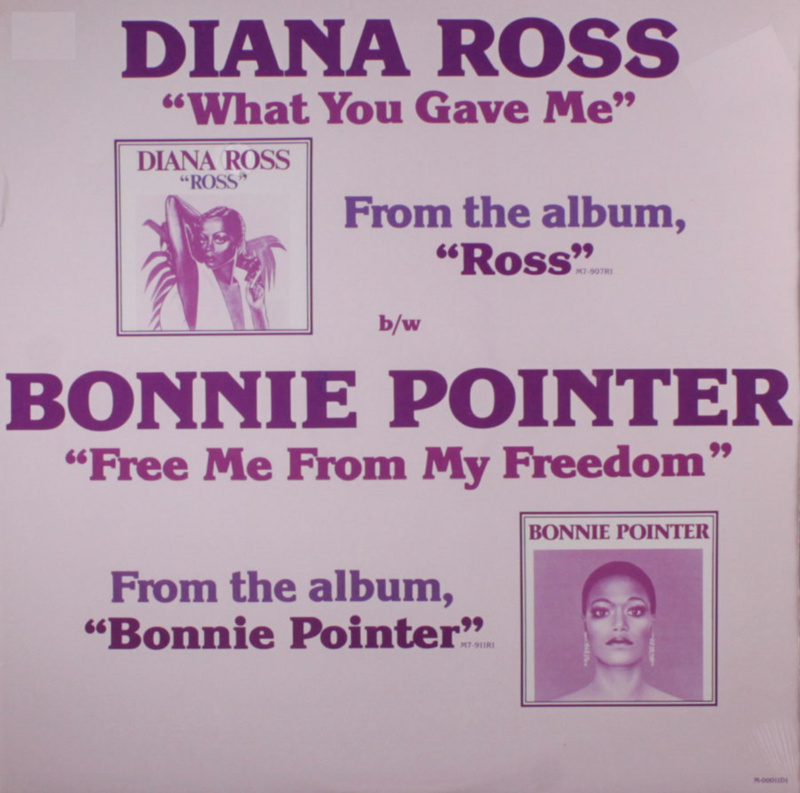 This immediately sets it apart from dance cuts of the time, many of which justifiably emphasized beat over melody and vocals; here, Miss Ross remains front and center for the entire song, offering up a fully-engaged vocal that’s far more bright and alive than either of the previous two disco offerings on Ross. Diana really pushes herself here, especially at two minutes in, when her voice suddenly soars to a series of high notes (as she sings the song’s title) in a thrilling, soulful moment that foreshadows her powerful vocal run on 1979’s “The Boss.” It’s inconceivable that Motown passed over the chance to push “You Were The One” to radio and clubs at the time; the song has “smash” written all over it. The reality is that “What You Gave Me” likely got the single release because it was produced by Hal Davis, who’d given Miss Ross her last big smash with “Love Hangover” — it had long been Motown protocol that when a producer scored a hit single on an artist, he or she got precedence on releasing a follow-up. Still, Diana did add “You Were The One” to her live act; in its review of her September 19, 1978 opening at Universal Amphitheater in Los Angeles, Billboard mentioned that Diana connected “You Were The One” to “Ain’t No Mountain High Enough” before closing with “Reach Out And Touch (Somebody’s Hand).” Although the tune was dropped from the act by the time that The Boss came out in 1979, at least audiences got to hear it for a while; it’s a shame more didn’t, as this is one of Diana’s best. 5. Reach Out, I’ll Be There: The second side of Ross, beginning with this cut, is where the album gets a little strange. “Reach Out, I’ll Be There” wasn’t a new track in 1978, nor was it an old recording which had been lifted from the Motown vaults; amazingly, this song had already been released as a single by Miss Ross, and had garnered respectable chart positions back in 1971. Produced by Nick Ashford and Valerie Simpson and included on Diana’s third solo album, Surrender, “Reach Out I’ll Be There” (at the time, the song was listed without the comma) peaked at #29 on the Billboard Hot 100 and at #17 on the R&B chart; the Holland-Dozier-Holland song, of course, had enjoyed far more success when it was originally recorded by The Four Tops in 1966. Ashford & Simpson slowed down the song and stretched out in an obvious attempt to replicate “Ain’t No Mountain High Enough,” and while it wasn’t as successful sales-wise, it’s a beautifully done production that was among the best of Diana’s early solo output, and featured a particularly gorgeous lead vocal. So…why is it here on Ross? It’s possible Motown was hoping to capitalize a bit off of Gloria Gaynor’s 1975 disco version of the song; the singer had included it along with another Motown song, “Never Can Say Goodbye,” and “Honey Bee” as an extended disco mix on her LP Never Can Say Goodbye. If that were the case, someone at Motown could have easily remixed the song and turned it into an uptempo dance cut (similar to the new backing given to “Lovin’, Livin’ And Givin'”); instead, it’s only slightly reworked here, with a longer running time and a few changes in the instrumental track. Diana’s vocal is the same take used in the previously released version, and this is good thing; her performance is astonishingly lovely, each syllable landing like a crystal-clear drop of water. In a way, her vocals during these first three minutes foreshadow her work on the Lady Sings the Blues soundtrack, as she lags behind the beat with the command of a seasoned jazz singer. Then, of course, things begin to build; Miss Ross, buoyed by the choir of background voices, repeats the phrase “You can always depend on me” over and over again until the track explodes into a soulful climax, featuring some of the best belting of Diana’s career. Because “Reach Out, I’ll Be There” is such a strong recording, it doesn’t sound jarringly out-of-place coming after the previous four songs; this is especially true given that “What You Gave Me” provides an Ashford & Simpson connection. Even though something previously unreleased would have been nice to kick off this album’s second side, it’s impossible to complain about a recording this good. 6. Sorry Doesn’t Always Make It Right: This is another previously released recording, although it makes its debut on a Diana Ross album here; the country-pop ballad had been released as a single back in February of 1975, basically to keep Miss Ross on the charts while she was busy filming Mahogany. Although the tune was written and produced by Michael Masser, who’d given Diana hits with “Touch Me In The Morning” and “Last Time I Saw Him,” it failed in its mission; the single missed both the pop and R&B charts, though it did peak at #17 Easy Listening. Because of this surprising lack of success, “Sorry Doesn’t Always Make It Right” was left off of Diana’s 1976 LP Diana Ross, and it probably would have disappeared forever had Masser not produced another version of the song for Gladys Knight & The Pips. Released in October of 1977, Knight’s recording climbed into the R&B Top 30; around the same time, Masser signed a publishing deal with Arista Records, with company president Clive Davis proclaiming, “No one is writing more beautiful songs, more lasting copyrights today than Michael Masser” (Billboard, November 29, 1977). With Masser now working for Arista, it’s likely Motown scrambled to find and release any and all unused Masser-Ross collaborations, and suddenly “Sorry Doesn’t Always Make It Right” and its forgotten b-side, “Together,” ended up on Ross. Although Diana’s “Sorry Doesn’t Always Make It Right” was released in February of 1975, it was recorded the previous year, as a follow-up to her country-themed hit “Last Time I Saw Him;” thus, the ballad leans heavily toward country music again, with a shuffling instrumental track made up of honky-tonk piano chords, a lilting harmonica, and guitars. Diana begins her performance in a startlingly high register, sounding more youthful than she had on the earliest of Supremes hits; her delivery is delicate throughout, and she nails each note with skillful tonal precision and crystal-clear enunciation. Overall, the track is every bit as well-produced as songs like “Love Me” and “No One’s Gonna Be A Fool Forever” from 1973’s Last Time I Saw Him, and it’s a shame this song wasn’t finished in time to be included on that album, on which it would have fit seamlessly. Unfortunately, as part of Ross, it does feel out-of-place; the style doesn’t quite mesh with the disco cuts or the smooth pop ballads, resulting in a pleasant but incongruous inclusion. 8. To Love Again: This previously unreleased ballad was recorded back in 1975; written by Michael Masser and Gerry Goffin, it was considered for the Mahogany soundtrack before the decision was made to include only instrumental music on that album, aside from the popular theme song. It’s strange that “To Love Again” wasn’t then placed on 1976’s Diana Ross, on which it would have fit beautifully; perhaps Ross and Executive Producer Berry Gordy, Jr. didn’t want to overload that album with Masser ballads. In any case, “To Love Again” sat in the vaults until Ross, and it’s more than deserving of a place here; this is one of the singer’s best ballad performances ever, a tender vocal that displays Diana’s gifts for subtlety and control. The song itself is one of the more unusual in the Ross discography; Masser (along with arranger Lee Holdridge) crafts an instrumental that’s basically an homage to French cinema, utilizing a prominent mandolin, accordion, and romantic strings to set the mood. The European inspiration is likely a direct result of Masser’s scoring the film Mahogany, since a good portion of the film takes place overseas (although the movie is set in Rome, not France). Because the instrumental track is so ornate, it would be easy for Diana to get lost a little in the mix; thankfully, she rises to the occasion, minting a rather deceptive vocal that sounds far more simple than it actually is. This is, of course, a reason that Diana is all too often overlooked as a vocalist; because she doesn’t run up and down the scales here, showing off her range with bombastic gymnastics, the casual listener might mistake her singing for being weak or “limited.” However, a song like “To Love Again” requires careful, multiple listens; only then is the complexity of Ross’s singing revealed. Her vocal control during the first minute or so is extremely impressive; she is singing a challenging melody line and is required to hold certain notes and words for several beats at a time, but never sounds like she’s putting any excess effort into her performance. And her singing of the song’s title at 2:19 (when she takes them an octave higher than she had earlier in the song) is one of the single most beautiful moments in a Diana Ross recording; her delicate, crystal clear reading of the words, and her four-note improv following them, combine with the soaring strings of the instrumental track to create a breathtaking musical interlude. Although the song was likely too stylized to have been a radio hit, it’s a masterful recording; Miss Ross added the song to her live act, and actually performed it after being carried onstage in a giant pink shoe! A few years later, “To Love Again” would get a second life when it was featured on a collection of Michael Masser-Diana Ross recordings titled To Love Again and released by Motown in 1981; the song was also placed on the b-side of the “Cryin’ My Heart Out for You” single, released that same year. 9. Together: Ross closes with a final Michael Masser holdover; this snappy little song had been the b-side to the “Sorry Doesn’t Always Make It Right” single, first released in February of 1975. Masser wrote the song with Pam Sawyer, and it was also cut on Motown singer Thelma Houston; her version (along with her recording of “Theme From Mahogany“) was finally released in 2015, on a CD expanded edition of her album Any Way You Like It. “Together” certainly stands out when it comes to Masser-Ross collaborations, mainly due to the fact that it isn’t a love ballad; the recording sounds more like something that would have featured on Diana’s 1970 effort Everything Is Everything, bearing some musical similarities to that album’s title track. The bouncy song is pure 1970s pop; it’s simple and repetitive, and sounds like it could have been used as the theme to a sitcom of the era. It doesn’t date particularly well; there’s a timeless quality to the very best Masser productions, and this one doesn’t have it. That said, it’s a pleasant listen and certainly isn’t a bad recording; it doesn’t add much to Ross, but it at least serves as a reminder that Diana Ross and Michael Masser were capable of producing more than just big, romantic ballads. Although it got little to no promotion and didn’t produce any hit singles, Ross did manage to make the charts in the wake of its release, climbing to #49 on the Billboard 200 and #32 on the R&B Albums chart. Amazingly, even with tons of promotion, The Wiz (Original Soundtrack) didn’t fare much better, only climbing to #40 on the Billboard 200 and #33 on the R&B listing. Coming off of the commercial smash Diana Ross in 1976 and the critical success Baby It’s Me in 1977, this double dose of disappointment must have been a surprise to Miss Ross and Motown; Diana quickly moved on from both lackluster projects, returning to the studio with her old friends Nickolas Ashford and Valerie Simpson in 1979 and turning out a batch of thumping disco-soul tracks that would make up her next album, The Boss. That album returned her to both critical and commercial favor, and with its success, Ross faded into obscurity once and for all. Still, there’s much to be rediscovered on this 1978 album; though only die-hard fans have likely ever heard “You Were The One,” “To Love Again,” and “Never Say I Don’t Love You,” they are among the best work Diana Ross released in the 1970s. After several years of relying on the kind of smooth, laid-back singing she’d discovered while recording Lady Sings The Blues, Miss Ross had begun taking some chances again, and it’s nice to hear her push herself vocally, particularly on “You Were The One.” Had the older, outdated songs, particularly “Sorry Doesn’t Always Make It Right” and “Together,” been left off in favor of some unreleased tracks of the era (Greg Wright’s “Share Some Love” and the sterling disco cut “You Build Me Up to Tear Me Down,” produced by the Hollands, come to mind) Ross would have felt like a more fully-formed album. But even with such a strange, uneven tracklist, Diana’s consummate artistry and the incredible musicianship of those surrounding her shine through. This entry was posted in Studio Album and tagged Berry Gordy Jr., Diana Ross, Greg Wright, Hal Davis, Michael Masser, Motown, Ross (1978). Bookmark the permalink. An odd one for sure ! At the time I thought Motown were trying to ruin her career. Over the years I’ve grown to accept it for what it was, but it’s fair to say that it can be passed over by all but the most devoted fans. The mix of Reach Out remains the best released, and the ballads Where Did We Go Wrong , Never Say I Don’t Love You , and To Love Again make the album worthwhile. The cover artwork on the other hand…. well, let’s just be kind and say it was a nice idea but it didn’t quite work ! Shame considering some of the wonderful photo sessions from around this time would have/could have been so much more attractive. Wayne — this cover fascinated me as a kid, as this was one of the first LPs of hers I ever owned (who knows how I got it, since I wasn’t born until 1980…my parents must have found it somewhere!) — I thought it was so strange. I totally agree with you — with the amazing photo shoots happening in the late 70s, and the fact that she was so strikingly beautiful during this period, why in the world did Motown choose this?? Now you’re making me feel old Paul ! Kid indeed ! I must have been not far from a kid myself when it was released – if only – HA ! I do remember reading an interview with Diana in which she described the concept of an album cover which turned out to be this, so I guess it’s her own fault. Pity they didn’t use the now classic photo of her with her hands on her head, it might have helped sell the album too. For whatever reasons, “Ross” slipped out of my attention, maybe it was not even released in my country! So I only got to know it recently, and in my opinion it does not sound outdated at all. As we learnt from the interview in “Rolling Stone” you quoted, most /all of the new tracks were recorded concurrent to “Baby it’s me”. Yes, the songs you highlighted are superb. “To love again” sounds like a French chanson, no wonder she is so popular over there.The only track I disagree on is “What you gave me” – I really don’t like disco, but her vocal take is so energetic – a feel-good song. And it is really interesting to compare this version of “Where did we go wrong” – wonderful! – to the earlier one, where in the beginning her voice cracks in a way never heard before or after. Perhaps it was very personal to her. In this context I would like to mention her marvellous rendition of “For once in my life”, which must have been recorded at about the same time and is not available on CD so far. Though I find the intro a bit whiny, I absolutely fell for her version, stunning. Should have been a single, too! I never really understood this album – although I was very young when it came out. A few years ago, a friend made me a CDR of it and it seemed like a combo greatest hits/extras CD. I guess with Baby It’s Me and The Wiz coming out around the same time, this got lost in the shuffle? Wayne, did you buy this album on LP? I don’t think it’s ever been issued to CD, has it? PS. If we were including RCA album cuts, I know “Crime of Passion” and “It’s hard for me to Say” would be on the list!!! Lawrence — your list of “lost hits” is just about perfect in my mind! I completely agree with the tracks you chose, and would add “You Were The One”…”Top Of The World”…”Ain’t Nothin’ But A Maybe” (which could have been a nice R&B hit)…and the Marvin Gaye duets “You Are Everything” and “Stop, Look, Listen.” As for the albums I haven’t posted about yet…I think “No One Gets The Prize” could have been huge had it been released and handled propertly…and maybe “Give Up” from the diana album. I totally agree about your 2 RCA choices, too — why in the world didn’t Diana release “It’s Hard For Me To Say,” which could have been a #1 R&B hit?!? I think “Let’s Go Up” should’ve been a big pop hit…and I think “Touch By Touch” could have done well for her, too. Ah…so many great songs that should’ve been hits!!!!! Hi Lawrence, yes I did indeedy buy this on vinyl first time round, and you are correct, to date it is the only one on Diana’s albums not to have been released on cd. Looking forward to it’s first official appearance on cd in the not too distant future. Is there word that this will be issued on CD? That would be great! Do you have all of Diana’s albums? Which are your favorites? I was trying to limit it to one track from each album – but yes, there are so many under- appreciated gems! And there are lots of later day Diana songs that should have been big too…especially on Take me Higher and Force Behind the Power…. by the way, are you in Los Angeles? I grew up in DC and NYC but live in LA. Are you on Facebook? I enjoyed your review of ROSS album as probably most fans, and feel it was spot on.i loved NEVER SAY I DONT LOVE YOU / YOU WERE THE ONE/TO LOVE AGAIN/WHERE DID WE GO WRONG. your review was if you read my mind. i wasnt crazy about this album at first but it has grown on me and now it’s a favorite although my cdr opy has all the songs from the 1981 TO LOVE AGAIN album as bonus tracks and i delletted two of the country flavored tracks to make it sound more cohesive. i look forward to the deluxe edition of this album. ps. they recently found 4 more tracks by diana from this era in the vaults. Thanks, David. Wow — they found 4 new tracks?!? That’s awesome! Wish I could have a few days to rummage through the Motown vaults and search for lost treasures myself!! Paul,yeah and she sings the heck out of a Stevie song. i remember when she sang RIBBON IN THE SKY in central park.i always hoped she would record that one.beautful song. paul, you know, i didnt like the cover orignally but it has grown on me as much as the album itself. i think this future expanded collection may have the most surprises since it seems to be the most confusing album with all its previously used tracks??maybe? First of all – great blog. Great to see Diana’s musical output getting proper props. Really like the design too. I’ve got a feeling it’s pretty unlikely Motown will give this the ‘Deluxe’ treatment the way they’ve been working through the rest of her back catalogue. More likely they’ll add the cd-unreleased tracks (the main one being ‘You Were The One’) as bonuses to ‘Baby It’s Me’ Deluxe along with 12″mixes + alternate takes and unreleased tracks from the era. The only sense I can make of the ‘Ross’ set in hindsight is Motown originally were considering a mainly disco-orientated album (centred around the Hal Davis + Greg Wright sessions, plus some Holland & Holland productions) and reconsidered – giving over the entire 2nd side of the vinyl to old or previously-shelved ballads. Maybe they thought too much disco was too risky for her fan base, or maybe they weren’t convinced of the quality of the tracks – who knows? The Holland & Holland tracks were at one point going to be issued on the 1982 aborted album ‘Revelations’ which was intended I guess as a spoiler to her debut RCA album. Thanks, spookyelectric! Glad you found the blog and am excited for your input! I agree with your assumption that Motown had planned for this to be all disco, then reconsidered…and I wonder if it wasn’t the quality of tracks. Although I like certain songs like “For Once In My Life” and “You Build Me Up…” — I wouldn’t consider any of them “lost treasures” or highlights for Diana. Still, there was so many good tracks in the vaults (i.e. the ones left off “Last Time I Saw Him” and “To The Baby”) — why choose those instead of previously-released singles? Very strange. I have always assumed there would not be a “Ross” re-issue…mainly because you can get the songs from it on other CDs. I woudn’t be shocked if the album-version “Where Did We Go Wrong” shows up on the “Baby It’s Me” re-issue. But who knows?!? Agree – it would be good to have the ‘Ross’ versions of ‘Where Did We Go Wrong’ and ‘What You Gave Me’ on CD. I think ‘Baby It’s Me’ maybe the next (and last) Motown deluxe reissue on Diana so let’s wait and see. Interesting to hear of Maureen McGovern’s version of the song – I didn’t even know it existed. By the way ‘To Love Again’ was also covered by cabaret singer Jane Olivor on her 1980 album ‘The Best Side of Goodbye’ – one of several Michael Masser tunes she recorded. You can check her version on youtube – it’s closer to the ‘french’ version just released on the DR deluxe two disc. And ‘Together’ was cut by Stacey Lattisaw on her mid80s ‘I’m Not The Same Girl’ album (suits her better than Diana I think) alongside a few other Masser tunes including ‘I Thought It Took A Little Time’. Thought you might to know! The album that leaves me mystified, and not in a good way! I would love to hear a behind the scenes story of what went on here, for there were enough tracks recorded to make this a complete original release and not some haphazard end product that doesn’t cohere properly! Imagine these together with the other originals and it makes for a far more cohesive and listenable record from start to finish. It would have given enough of a nod to the burgeoning Disco of the time whilst still giving Diana the chance to shine on the ballads with some interesting MOR. Also the production of one of my favorite Masser tunes, Where Did We Go Wrong, seems oddly quiet…I actually prefer the other version on Last Time I Saw Him re release, simply because of the sound quality. There are some stunners here like You Were The One and Never Say, and I do think that What You Gave Me is fun and really quite listenable and groovy. Love Loving Living Giving- it’s a taste of 1983’s Pieces Of Ice in a strange way! To Love Again is something absolutely rare and beautiful, but do not know if it had a place here. Oh well, some things we will never figure out! does anyone know exactly WHEN “we can never light that old flame” “fire don’t burn” and “you build me up to tear me down” were recorded? i know they were supposedly done for the ‘ross’ lp, but her voice sounds like it’s from an earlier period (does anyone agree with this assessment) and wikipedia lists these tracks as being recorded from 1975 to 1977 (if you read the entry for the ‘diana deluxe’ cd). very confusing indeed…. Interesting question — and I’m not sure what the answers are. In so many cases Miss Ross seems to have re-recorded her vocals to certain tracks, so it’s hard to say — the tracks may have been recorded in the mid-70s, with her vocals being re-recorded a few years later. WOW! Can’t wait to see what ends up on the “Ross” release! Will be so glad to FINALLY get “Where Did We Go Wrong” remastered! I know what you mean — “You Were The One” NEVER gets old to me. It would have had a long life had it been released, I think. i just posted a new edit i made of this song on youtube, wanted to share with everyone here. i’ll be posting many more edits i’ve done, so keep checking!!! You know what I agree so much about never say I don’t love you it’s such an amazing song and maybe not a single but definitely one that is the classic song when the best of the 70s soul am yeah The lp wasn’t handled correctly it needed maybe a little bit more new songs should of been added and more soul ballads and not just songs thrown into the mix just to kind of be there it really feels off but it is a good record I do I like the cover has a “Cuban” feel to it! Ross 1978 will be released by Culture Factory on Feb 24 2014 at a bargain price. If the quality matches some of their other reissues I’ll be more than happy. I have to say I think they (Motown) screwed this collection up, but I do like most of the songs. I do agree that Motown lost out on many tracks. so many gems. I always thought YOU WERE THE ONE should have been the single along with NEVER SAY I DONT LOVE YOU…TRUE CLASSICS. I hope we get more physical CDs…but I’ll take the music can way I can get it! I bought the album the day it was released, like I did with every Diana album in the 70s, and only yesterday when I was looking at a 1978 Harmony Hut ad (who else remembers Harmony Hut?) on my door with a little photo of the cover (“$4.99 LP! $5.99 tape!”) did it occur to me that the painting was a riff on the “Baby It’s Me” cover–arm behind her head. 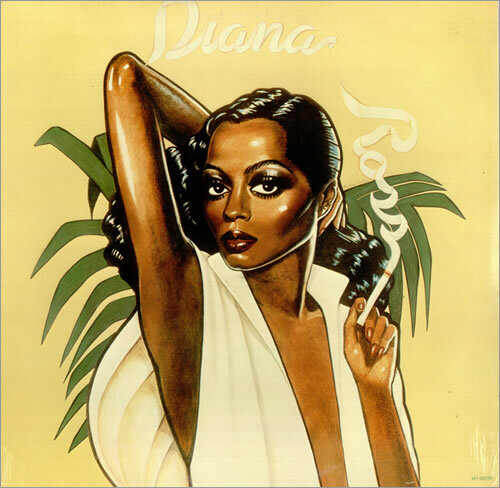 While the arm is inspired by the “Baby It’s Me” cover, her face is based on the picture featured on the back of the “Diana Ross” 1976 “black” album. well the 40th anniversary deluxe edition will be out later this summer, as we are getting SING H-D-H first, I am looking forward to this collection as I think this album has been so misunderstood for so long. it’s not a compilation, it’s a Motown album by Diana. the new expanded edition will make sense of the collection with all newly discovered tracks. I think Motown was doing to Diana what RCA was doing to Elvis. using her name and releasing inferior product or albums. I know Elvis was getting frustrated with the record company with how his catolgue was being treated or released. the only difference , it seems, that Diana wasn’t aware what Motown was releasing or when, which seems strange. not the first time I heard that but I did know she was unhappy with the release of LAST TIME I SAW HIM lp and apparently told BG he was losing his touch. I kind of felt that was the case from 1970 and how he kept her off tv for a year and didn’t like either Aint No Mountain , or even Stoned Love for the Supremes but luckily, both got released.